Ironically enough, my most used tool in the shop. I wanted to learn how to TIG weld, and at the time just signed on with a new company and had a nice signing bonus in pocket. I looked at both Miller and Lincoln... and the specs just led me to go with an Inverter based unit. 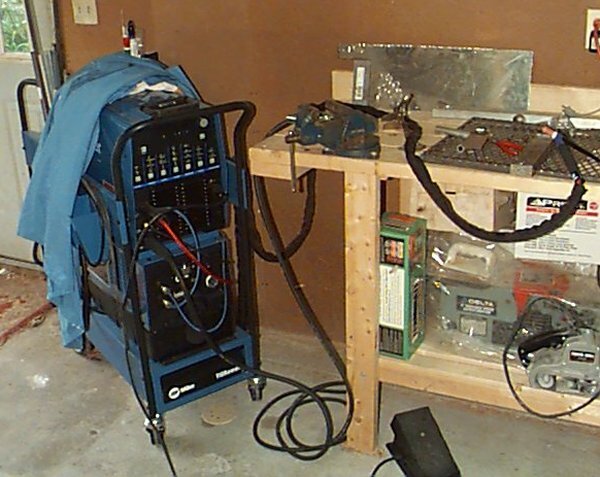 I have limited power in the garage ( only 50 Amps 220 ) and a transformer based model to give me the 300 Amps I wanted to do thick AL would have taken almost 80-90 Amps. Not to mention, a transformer based unit would have taken 3 times the space and 4 times the weight. So in my research, Miller released this unit and I fell in love with it. The welder is the top unit and its all digital. The controls read like a laboratory waveform generator ( so it came to me quick ). Understanding the controls is however the only thing that came to me quick. Thanks to all my friends who let me "weld stuff for them for cost of materials" so I could learn how. I feel now after a couple years of projects that I can weld confidently with this unit. It would have been a great help if Miller had included instructional videos with their unit. The bottom unit is the water cooler for the torch. Highly recommended especially when welding heavy Aluminum. The only beef I have with it is that it did not come with ( and was not available for purchase ) a canvas cover for it. I told Miller how disappointed I was that a $7000 welding systems didn't come with nor could I purchase a cover to protect my investment. I just noticed in the 2005 catalog that they now offer one. So miller if you are reading this... could you please send me my cover ? Copyright 1998 ACS. All rights reserved.